Stonehenge Metals (ASX:SHE) has just finalised an option agreement with Protean Energy Limited. This deal grants SHE an exclusive 24-month license over and option to acquire the Protean TM Wave Energy Converter technology – which can uniquely generate electricity and produce desalinated water by harnessing all six degrees of ocean wave motion. SHE will now accelerate its efforts to push the Protean TM system into full commercialisation – potentially making it the first company in the world to develop wave energy technology at a commercial scale. The global renewable energy market is tipped to be worth over $600BN by 2015 . Wave energy is an emerging technology in its infancy, however it represents a lot of potential – the energy density in waves is many times greater than solar or wind. In order to proceed with this agreement, SHE has successfully raised over $1.4M. The company is currently capped at only around $3M – not much above cash backing. Under the terms of the deal, SHE has the option to acquire 100% of the equity of the technology owner, Protean Energy Australia Pty Ltd (PEA). The Protean wave energy technology has passed the demonstration phase already – the next steps are to deliver a pilot project and then ramp up to commercialisation globally. 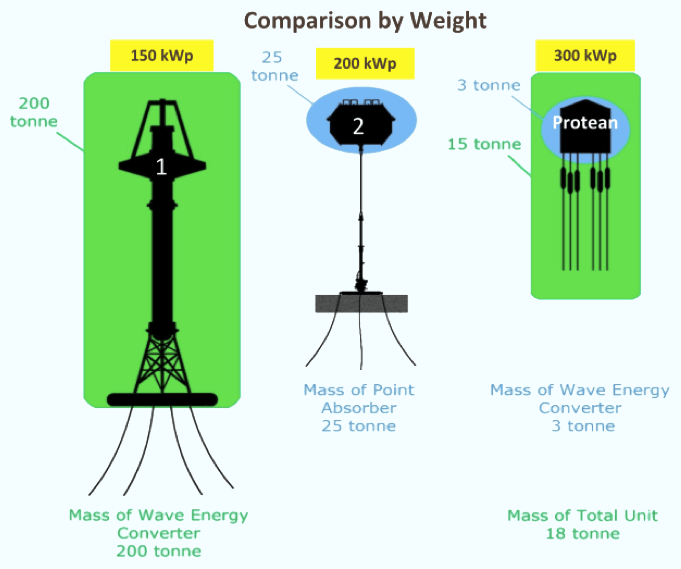 The Protean TM Wave Energy Converter technology concept is comprised of groups (arrays) of power generating buoys located offshore. Each buoy in an array floats on the ocean surface, where the most energy can be collected, and is tethered to the ocean floor. Movement of the waves activates a number of pulleys attached to a counterweight system, which generates shaft power for easy transformation into either desalinated seawater or electric power that is then transferred to shore. Catalysthunter.com first covered SHE and its move to acquire the Protean TM system in September with the article Acquisition Of Breakthrough Wave Energy Technology . That article contains a more complete explanation of how the system works. SHE’s focus will now be to accelerate the development of the Protean TM system and bring it to commercialisation. To date no company in the world has successfully commercialised wave energy technology. It is an untapped market, and whoever cracks it first could make billions selling its system to the rest of the world. This is the game SHE is now playing in with its Protean TM technology. The reason why many companies are trying to be the first is that wave energy is much more powerful than other forms of renewables like solar or wind. If just 10% of the wave power on Australia’s coast was harnessed, it could power more than half of the country’s present energy needs. 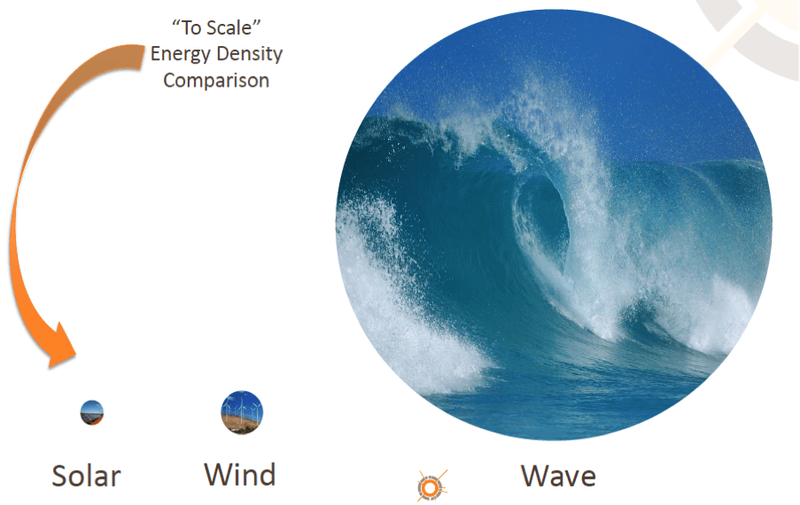 The reason for this is energy density – there is simply more power per unit area to collect in wave motion than from wind or solar – not to mention that wave energy is very predictable and highly available. This means that an array or energy production farm of Protean TM buoys could generate significantly more power than an equivalent sized wind or solar farm. Renewables could be worth over $600BN by 2015 and are predicted to keep rising – so SHE has entered a sector with enormous potential. SHE has a market cap of around $3M, relatively small given the potential of the wave energy technology it has an exclusive option to acquire. 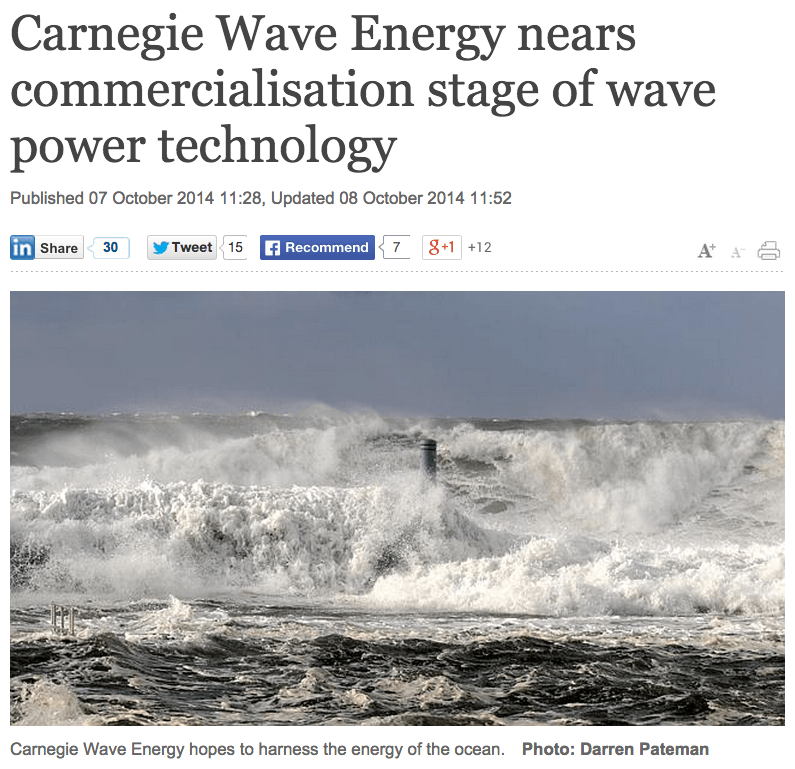 Another ASX-listed wave energy company, Carnegie Wave Energy, is in a similar position to SHE with regards to development of its technology. It has not been able to commercialise its technology to date, however it is capped much higher at approximately $90M. If all goes to plan, Carnegie’s first customer will be the Australia Department of Defence whose naval base HMAS Stirling will receive energy from a wave energy array it’s currently developing. Carnegie points the way for SHE as it moves to push its Protean TM technology into the market as well. But there is a crucial difference between Carnegie’s and SHE’s wave energy technology. Carnegie’s buoys are submerged below the water while SHE’s float at the surface. A big advantage SHE’s Protean TM technology has is that its surface buoys can access the greatest available wave motion because the surface is where that wave motion is at its most intense. For a detailed explanation of the Protean TM system, check out cataysthunter.com’s first article on SHE Acquisition of Breakthrough Wave Energy Technology . Basically, the Protean TM system utilises buoys that float on the surface of the ocean and are tethered to the ocean floor by cables that run over pulleys in the buoy. The movement of the buoy through six degrees of motion pulls the cables and turns a shaft, which in turn generates power or desalinates seawater that can be sold to a potential customer. The image above is a representation based on publicly available information for competitors 1 & 2 compared with as yet untested projections for a larger scale Protean device used in an offshore environment. The competitor 1 & 2 devices depicted are for illustration purposes only & may not be the only or most recent devices offered by a competitor. Protean TM buoys can be deployed in small or large arrays off any coast in a variety of depths and surface conditions. Because they are on the surface they are easy to replace and service as well. Now that SHE has secured an exclusive 24 month license and option to acquire the Protean TM system its intention is to push the technology to the commercial stage. A key figure in this work will be Sean Moore, the Protean WEC’s inventor, who will be joining SHE as its Chief Technology Officer (Wave Energy). Moving forward, the plan is for a pilot plant to be constructed in Western Australia. However, the ultimate goal is to tap into the rising global demand for wave energy technology and desalinated fresh water supply. Now that SHE has secured an option to acquire the Protean TM Wave Energy Conversion technology it will accelerate its efforts to bring the system to the market. This will be done chiefly through the construction of a pilot plant that will be used to demonstrate the technology to potential buyers. This is expected to be in place within 18 months – and it’s a process that will provide a continuous flow of development catalysts. SHE is now Australia’s newest player in the renewable energy resources game with the potential for a scalable, cost-effective and demonstrated piece of wave energy technology it is on track to commercialisation.